Working on a wide variety of visual arts events, community projects, public celebrations, educational training, participatory events, site specific installations, carnivals, lanterns, parades and public arts since 1996, Fiona is Fine Art trained and has vast experience working in her field. Working solo or in collaboration, Fiona aims to work with community involvement to create, experience and celebrate through art. 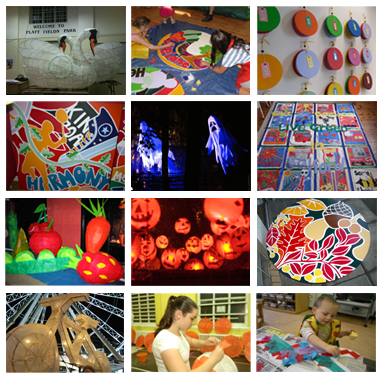 Connecting with all ages and abilities to produce beautiful shows, illuminated installations and events. Offering high quality educational projects within schools, galleries, museums, parks, gardens, theatre and streets. Utilising recycled materials where possible, encouraging awareness, learning and developing skills. Themed work can be culturally diverse, eco aware, worldwide, home based, historical, flamboyant, scientific, decorative and imaginative. Fiona enjoys responding to themes and developing ideas. As well as celebratory seasonal events and painting projects, devising creative activities and family friendly events, Fiona regularly coordinates and produces a variety of annual lantern parades throughout the North West. Fiona often collaborates with artist Jo Foley and together they have produced many successful creative commissions.